What is the secret to a slower life? Would you even want a slower life? How can you feel productive but not crazy? Being a mom is a busy job. Raising children is filled with complicated moments, chaos and a constant push-and-pull feeling. And yet, we long for more family time, more slow moments and less busy. 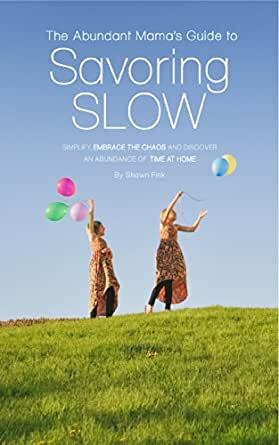 The Abundant Mama’s Guide to Savoring Slow is just that — inspiration, ideas and joy in the slow family moments that happen all day long. Fantastic, easy, inspiring read that is easy to refer back to time and again. No need to read front-to-back, just pick up and read as you need. Highly recommend to parents wanting to be the best parent they can be. I try to have an open mind to learn from writers whose style may not be personally enjoyable or particularly grabby, but this book disappointed across the board. While it had a few good thinking points and general encouragement to do less/slow down/embrace real life, there was nothing of substance that I found helpful in real day to day life. As a working mom juggling lots of duties and joys, I expected something coherently helpful or at least lyrically enjoyable like so many mommy-help books tend to be. This book had MANY typos, poorly constructed sentences and paragraphs, and generally was hard to follow. In my opinion, it should not be sold in this condition, with so obvious a lack of editing and proofing. It was a waste of money better spent on an expensive latte, and a waste of precious mommy minutes. 5.0 out of 5 starsThis book is for anyone wanting to slow down and sink into the beauty of their lives that is already in front of them. In this day and age, when we have so much coming at us, it can be easy to get caught up in the hustle and bustle and the chaos and busyness of raising children and having a family. It can spiral into doing too much on less sleep with less connection, and just moving from one thing to the next without really enjoying what is front of us. I know this bc that was me at one point in my life. That is, until I found Shawn Fink and her book Savoring Slow. In it she gives tips and ideas and just straight up talk about how to sink into the life you are living without it passing you by. I also have to say that as a mother of two small children, who works part-time outside the home, is trying to keep my marriage a priority, as well as my own personal goals, I don't always have time to read. Which is exactly why this book is perfect for me. If I happen to have the time, I can sit down and read a chapter with a cup of coffee and a snuggly blanket. But more often than not, I only have little chunks of time that I can't always devote myself to reading and the beautiful thing is that I can just open to any page and glean wisdom, grounding, ideas, for how to slow down and be in the moment of my life. I whole-heartedly recommend this book for anyone wanting to slow down and sink into the beauty of their lives that is already in front of them. This book will help you to show down, ban busy and embrace your perfectly imperfect live right now! The author writes what we all know to be true about enjoying our precious moments but seem to have trouble remembering in this busy modern life! Couldn't put it down! I love soaking up every word of wisdom in this treasure of a book! It now sits on my night stand so I can start or end my day with some of Shawn's wisdom! 5.0 out of 5 starsA MASTERPIECE!!! I have read this book more than once and use this as my BIBLE ! Savoring Slow awakens you reminding us that Life does get "busy" and stressful and when it does it is moat important to slow down and See the beauty in the "everyday " "ordinary " moments that we then are awakened to see these moments with with our children are anything but ordinary.. They are Amazingly BEAUTIFUL ... Because soon we realize our little ones will not be little for very long and we want them to remember and savor the memories of thier childhood .. They want to know that we were there .. We were and are PRESENT . Once we learn to master mindfulness and graditude our lives become so much greater OUR CHILDRENS LIVES become happier . it teaches us to take time for ourselves as mothers and as women so that we can be the best mothers / parents we can to our children ! This book is BEYOND A LIFESAVER !!! I recommend this book to ALL MOTHERS ! THANK YOU FOR THIS !!!! In a day and time when motherly life seems much more hectic each and every day, this book guides a mother how to savor each aspect of motherhood while the kids are still young and under one roof.